From arthritic pain to ligament instabilities, there are many knee injuries that can prevent you from performing your best. Patellar knee straps help reduce pain and provide extra support for the kneecap so you get back to your training and other daily activities. But first, here’s a brief explainer on how patellar knee supports work and what you should look for when buying your first brace. What is a Patellar Knee Support? Who Should Use One? A patellar knee support is a type of knee brace that is designed to provide extra support around the kneecap. They work by gently lifting the patella into the proper position and providing compression all around the knee in order to distribute pressure more evenly across the patellar tendon. Patellar tendonitis (“jumper’s knee”) – Patellar knee supports aid in the treatment of this common sport injury by preventing excessive lateral shifting of the patella . Arthritis – At least one study suggests that using a flexible knee brace can help reduce pain and increase range of movement in individuals with knee osteoarthritis. Osgood-Schlatter disease – Many doctors and orthopaedic surgeons recommend the use of hinged knee braces in the treatment of Osgood-Schlatter disease a painful condition that occurs in adolescence and causes pain at the top of the shin bone. There are six main types of stabilizing knee supports: closed and open patella knee supports, hinged knee braces, knee sleeves, knee straps, and patellar tendon supports. Below is a brief description of each type of knee support. Closed patella knee supports cover the entire knee and kneecap. These supports are designed to compress the patella when the knee is bent further than 45 degrees in order to prevent degeneration of the patellar bone. Closed patella knee supports also help minimize swelling and pain. 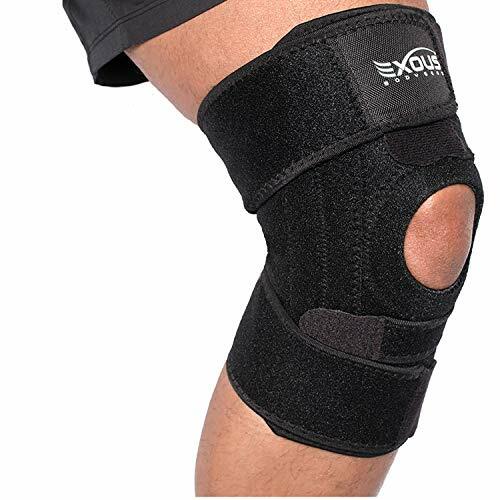 The “closed” design of these braces makes closed patella knee supports unsuitable for use when performing exercise or other tasks that require bending. Like closed patella knee supports, open patella knee supports help reduce pain and inflammation. Unlike closed supports, however, open patella supports are designed to leave the knee cap exposed. This allows for a full range of mobility of the knee. Hinged knee braces are usually prescribed by orthopaedic surgeons after surgery to repair ligament damage. This type of brace is designed to provide maximum stability and protection to the injured ligament as it heals. Generally, a hinged brace will need to be worn 24 hours a day until the ligament heals. Knee sleeves feature a slip-on/slip-off design. These types of support work well for reducing swelling and pain while allowing for full mobility of the knee. Many knee sleeves are made from lightweight, breathable materials and can be worn comfortably under clothing. Knee straps are designed to provide compression on the patellar tendon in order to reduce knee pain from patellar tendonitis, patella tracking, and Osgood-Schlatter disease. As with knee sleeves, most knee straps can be easily worn under everyday clothing. Patellar tendon supports are designed to compress the knee cap in order to more evenly distribute pressure across the patellar tendon. Patellar tendon supports are recommended for those with jumper’s knee. In this section, we’ll review some things you’ll want to look out for when choosing a knee support. Both open and closed patella styles provide protection for the knee and help prevent re-injury. There are several reasons why you may want to choose an open patella design over a closed patella support. For one, an open patella support will allow you to move comfortably through sports and workouts. On the other hand, closed patella knee supports offer greater stability. When shopping for a knee support, consider how you’ll use the brace and what level of patellar compression you need. A brace that is too large won’t provide enough compression to immobilize the knee and prevent an injury from re-occurring. A brace that is too small, on the other hand, may cause discomfort and restrict blood flow. Before purchasing a brace, refer to the manufacturer’s sizing guide to ensure that it will fit your leg. An adjustable support is a good idea if you want to be able to customize your level of compression to target aches and pains. Adjustable knee supports feature a variety of closure types, including Velcro and hook-and-loop closure systems. The right type of closure system for you comes down to personal preference, but keep in mind that Velcro tends to wear down over time, reducing the effectiveness of the brace. Patellar knee supports offer different levels of compression ranging from 1, which offers the least amount of support to 3+, which offers maximum stability and protection. Level 1 – Level 1 knee supports offer the least amount of compression. At this level, knee braces provide mile to moderate support while remaining flexible enough to allow for a full range of movement. A knee sleeve is an example of a level 1 knee support. Level 2 – Level 2 supports provide mild to moderate stabilization to help relieve pain from patellar tendonitis and ligament instabilities. Examples of level 2 supports are knee straps and wraparound braces. Level 2 braces allow for some movement, but are not flexible enough for sports and other strenuous activities. Level 3 – Level 3 supports are designed to provide maximum protection and stabilization. These supports are used post surgery and to aid in the management of severe instabilities. 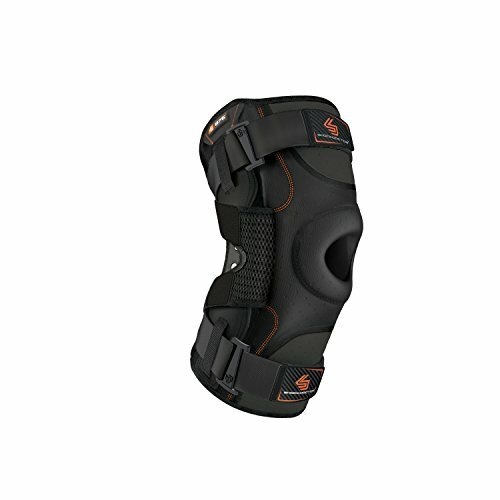 Hinged knee braces typically fall into this category. Now that we’ve covered the basics about patellar knee straps, let’s look at the best knee supports currently available on the market in terms of durability, price, comfort, and the level of support provided. The McDavid Level 2 Knee Support Wrap features an open patella design and a double-wrap adjustment system that allows you to customize the level of compression. It is made from a thin, lightweight neoprene that has a micro-cell structure to ensure superior stretch and heat retention. The McDavid Level 2 Knee support is highly flexible, which is good if you need a knee brace that won’t restrict your movements while playing sports. 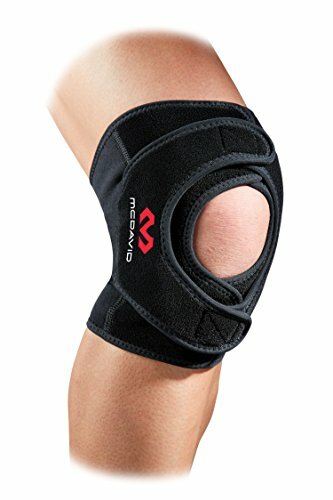 While a few customers have complained that the support tends to slip and the velcro wears out quickly, the McDavid Level 2 Knee Support with Double Wrap is an excellent choice for those with mild to moderate ligament instabilities, inflammation, or sprains. The Donjoy Performance Webtech Knee Brace boasts innovative features like dual-axed hinges that, which improves comfort and fit, and a silicone web that helps distribute pressure evenly across the patellar tendon for improved shock absorption. The brace consists of three parts: the silicone web, a compression moulded back pad, and an undersleeve with a built-in stash pocket. In terms of price, the Donjoy Performance Webtech Knee Braces is one of the more expensive options out there. This is a high-quality brace made from only the best materials, though, so you can be confident it will last for a long time. The EXOUS Knee Brace Support is an open patella support that is designed for athletes and those with active lifestyles. It is made from a lightweight, breathable neoprene and features a special four-point compression system that provides all-around stabilization during sports and exercise. The support also has a four-way adjustable strap system designed to keep the brace in place as you move around. The EXOUS Knee Support Brace is a very comfortable brace, and the adjustable straps do a great job of keeping the support from shifting. Some customers have reported, however, that the material is a bit flimsy and that the Velcro strips wear out quickly. 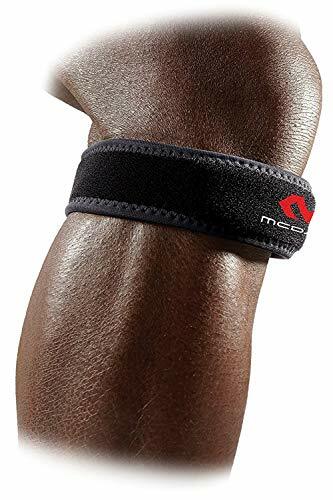 The McDavid Knee Support strap features a tubular design with a buttress that not only prevents the support from slipping, but also applies uniform compression to the patellar tendon in order to reduce pain from patellar tendonitis, patella tracking, and Osgood-Schlatter disease. The McDavid Knee Support Strap is very comfortable to wear, but some may experience skin irritation, as the buttress is made of latex. Another important thing to keep in mind is that sizing tends to run small. Before making a purchase, check the manufacturer’s sizing chart to determine the right size strap for you. The Shock Doctor Hinged Knee Brace features heavy-duty bilateral dual hinges that provide extra stabilization to the knee joint while allowing you to move around easily. It also features built-in stays that help keep the brace in place throughout even the most strenuous of activities. A special four-point leverage system lifts and compresses where needed to relieve pressure, which breathable and antimicrobial materials keep you dry and comfortable all day long. The Shock Doctor Hinged Knee Brace is ideal for use by athletes, after surgery, or to aid in the management of pain due to ligament tears, arthritis, meniscus injuries or patella instability. Due to the intense level of compression the brace provides, sizing tends to run small, so be sure to refer to the manufacturer’s size chart before making a purchase. The Cho-pat Dual Action Knee Strap is designed to improve mobility by providing targeted compression above the kneecap in order to reduce pressure from the quadriceps on the patella tendon. This knee strap is an ideal choice for those with patellar tendonitis, osteoarthritis, or Osgood-Schlatter disease. 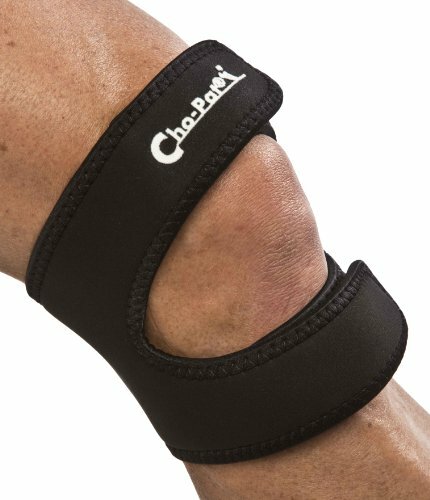 The Cho-pat Dual Action Knee Strap provides maximum stabilization of the patella while not restricting movement. According to the manufacturer, the brace is designed to be worn either over or under clothing, but some users have said that the support is too bulky to be concealed under everyday clothing. Another frequent complaint about the support is that the sizing tends to run large. Special attention needs to be paid to the sizing chart to ensure a proper fit. 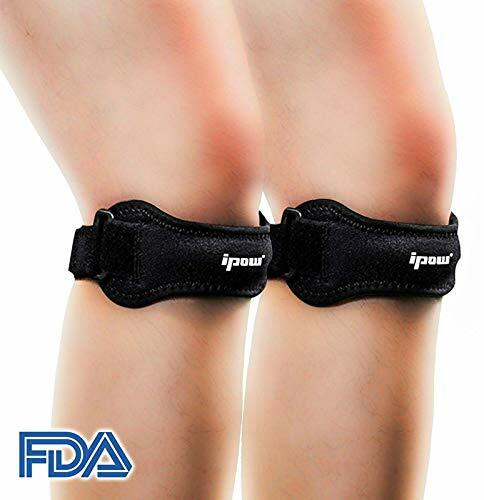 What makes the IPOW Knee Pain Relief Strap different than other knee straps is its unique segmented design, which provides extra support and allows for greater customization. The strap also features built-in slims that help reduce pressure on the patellar tendon. The IPOW Knee Pain relief Strap can be worn either below the kneecap or directly over the patella. The strap fits legs up to 18 inches in diameter and can be adjusted using hook-and-loop closures. Some may find the adjustment closures to be uncomfortable against the skin, but overall, this is a very comfortable brace that won’t restrict your movements as you continue to run, play sports, and engage in everyday activities. While all of the above patellar knee supports are excellent choices, we’ve chosen the EXOUS Knee Brace Support Protector as our final recommendation based on its stability, durability, ease of use, and price. If you need a budget-friendly patellar knee support that will provide all-day comfort and pain relief while recovering from a short-term injury, the EXOUS Knee Brace Support is definitely worth a look. The above patellar knee supports are among the best that are available and are suitable for treating a wide range of conditions, from patellar tendinitis to ligament instabilities. The right type of knee support for you will depend on a number of factors, including the nature of your injury and the level of stabilization required. Before purchasing a patellar knee support, it’s a good idea to consult with your doctor or physiotherapist for help in determining which type of knee support is best for your specific condition.